Abaca Ypua provides en suite accommodation 300 metres from Uhabia beach and 800 from the centre of Bidart. It has a restaurant, garden and free Wi-Fi. Abaca Ypua?s restaurant features rustic décor and serves regional cuisine. Guests are invited to explore Abaca?s garden and relax on the terrace. There is also a swimming pool and Jacuzzi for guests' use. Abaca Ypua is an ideal base for exploring France?s Basque region. 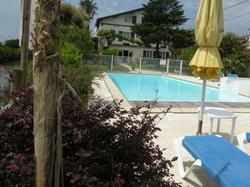 It is situated between Biarritz and Saint Jean de Luz and is easily accessible from the A63 motorway. Guests have access to free parking. A view of the surrounding area, an LCD TV with TNT channels and a hairdryer are included in the rooms.